Either way, you will enjoy sophisticated flavor combinations brought about by centuries of culinary evolution. Traditional or contemporary, enjoy catering unmatched in authenticity, with the subtlety and nuance of flavor that can only be imparted by a master of the cuisine. 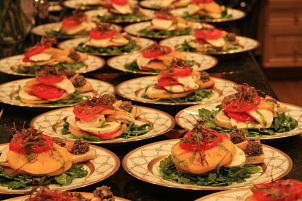 Event Finesse proudly presents French catering, Italian catering, Spanish catering, Japanese catering, Latin American Catering, and Middle Eastern Catering, among many others, all prepared by regional masters. Contact us to discover just how wonderful an artfully prepared meal can be!